Be the first to share your favorite memory, photo or story of Francisco (Paco). This memorial page is dedicated for family, friends and future generations to celebrate the life of their loved one. 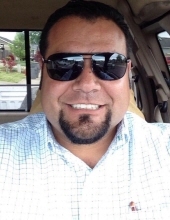 Francisco (Paco) Javier Estrada, 39, passed away at his home on March 31st, 2019. A celebration of life will be held on Monday, April 8th at 11am at St James Catholic Church in McMinnville Oregon. Burial service to follow Celebration of life at the Hopewell Cemetery. A viewing will be held on Friday April 5th at Macy’s & Son’s Funeral home in McMinnville Oregon from 4pm till 7pm. Paco was born on April 10, 1979 to Francisco and Maria (Luna) Estrada. He was born in Jalisco, Mexico. Around the age of 10 years old, they moved to Grand Island, where he began going to school at Dayton Grade School. He graduated from Dayton High School in 1998. On December 21st, 2004 he welcomed his first child Dairian Estrada. And then on August 23rd, 2007, Landon Estrada was born. His kids were the light of his life. He loved taking every opportunity he could to make memories with his children. They loved going camping together. Most weekends, you could find them at the beach, Flying M Ranch, or just going out to Grandma and Grandpa's in the trailer and making memories. They loved spending time with their dad having movie nights and going to Grandma and Grandpa Estrada's to shoot guns. Paco loved life, and lived his life to the fullest. His smile would light up the room and his laugh would make you want to laugh with him. He loved his family and friends with his whole heart. Paco was a loving dad, son, brother and boyfriend that left us far to soon. Survivors include his children Dairian and Landon Estrada of Salem; parents Francisco and Maria of Aurora MO; sister Brenda (Ernesto) Rosales of McMinnville; brother Jose (Amber) Estrada of Dayton; Sister Sandra (Rogelio) Monje of Aurora MO; brother Gabriel (Raquel) Estrada of Aurora MO; sister Lorena (Miguel) Garcia of McMinnville Oregon; sister Lilli Estrada of Aurora MO; girlfriend Anna Carjaval with her children Laylah and Raymond of Dundee; Nephews Jorge, Cristian, Alexis, David, Charlie, Hunter, Tanner, Sammy, Ivan, Mateo, and Gabe. Nieces Elisabeth, Hailey, and Erica. To send flowers or a remembrance gift to the family of Francisco (Paco) Javier Estrada-Luna, please visit our Tribute Store. "Email Address" would like to share the life celebration of Francisco (Paco) Javier Estrada-Luna. Click on the "link" to go to share a favorite memory or leave a condolence message for the family.